Polthaus Workshop: Make Your Mark. 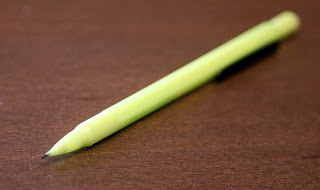 My go-to marking implement for every day woodworking is a .5mm mechanical pencil. While I still love the solid feel of a good old No.2, I prefer the mechanical pencil for it's narrow lead and quick "resharpening" ability (please ignore the obvious No.2 joke... or don't). Pencil is great because it erases quickly (good for my many, many mistakes) I can scrape it off the surface quickly and it doesn't mar my work piece. I like the cheapie mechanical pencils as I loose them frequently, seriously, the crappier the better. For rough framing, quick layouts and rough cuts I prefer the famous Sharpie marker, I buy these by the boatload too. The color of the sharpie is irrelevant to me though I like black the best, oh, and yellow is worthless unless you are coloring. A sharpie leaves an easy to see, clean line that doesn't wear off easily. Most of my framing equipment is covered in stray sharpie marks, it looks like a rainbow tried to claw its way out of my tool bag. They also make an ultra fine point marker that works great for more precise marks. I tend not to use sharpie for fine woodwork because it bleeds into the wood and makes finishing tough. The bleed also makes this one tough to use to make crisp marks on lumber. 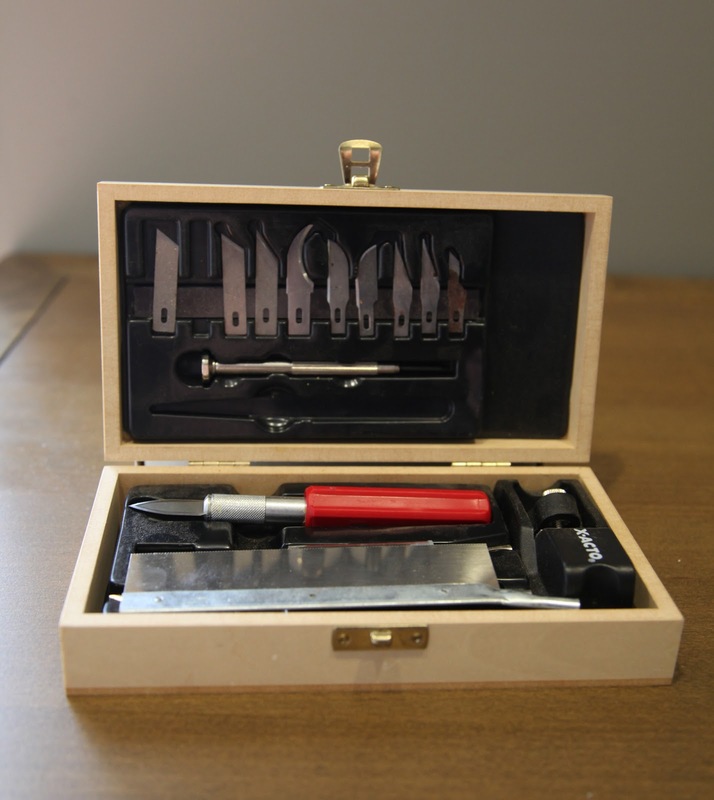 I also use marking knives for detail work and I really like them for laying out areas which will be cut, like dovetails or mortises because the knife starts a clean score on the wood fibers. 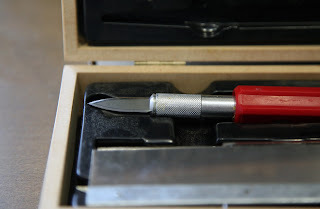 For a long time I have used an Exacto knife with the blade shown in the photo below. The blade shown has a bevel on both sides of the blade but they make single bevel blades. This one provides a good amount of flex, a super sharp edge (which can be honed quickly) and two cutting edges so I can use it with either hand. The Exacto knife parts the wood fibers cleanly and won't damage the surrounding fibers so I can get rid of the marks with a simple scraper when I am all finished. I am not a fan of knife marks left on a finished product, no matter how handmade they make it seem (duck and cover, I can see the hate mail already). These will likely stay in my tool arsenal forever. They work, they are cheap, and I really like being able to replace the blade. 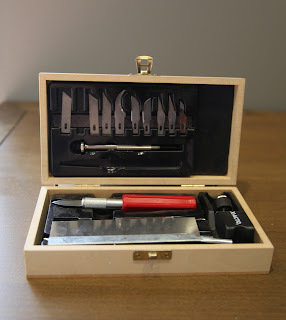 This one came as a set which I have used for years, they still sell these sets and I'd recommend one to any beginning woodworker and they have a million uses. Also, yes that is an Exacto handplane on the right, and no it is not worth the plastic it is made from unless you work strictly in balsa or foam. 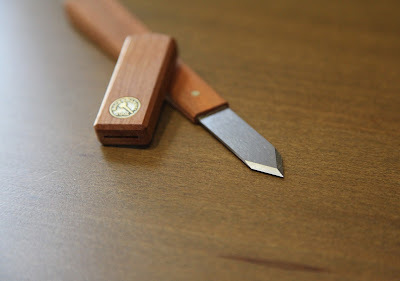 Recently, I purchased a specialty marking knife from Back Channel Tools. I had put off buying one for a long time and finally just bit the bullet and brought one home. I really like the look and feel of this knife, and it leaves an excellently defined mark. It is very well made and with a few minutes of honing has an extremely sharp edge which has remained sharp for quite a while. If you are looking for a specialty marking knife I can definitely recommend this one, I have been very happy with it for months. The rectangular handle, which I originally wasn't too sure about, has proven to be an improvement over my Exacto handle as it doesn't want to twist in my hand. The single bevel design makes it easy to track along my square and it is easy to sharpen and hone. The business end fits into a very well made cherry cap which has a magnet inside to keep the cap on. Instructions on properly using this marking knife can be found here Using The Back Channel Marking Knife. Now that I own a decent marking knife and have put it through its paces, I feel like making one would be a good project, though I doubt if mine will be as nice as the Back Channel one. 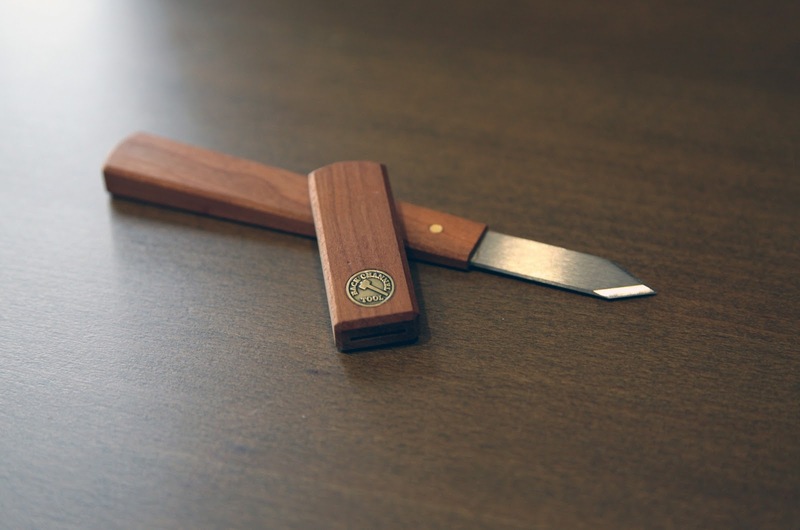 Look for instructions on making a marking knife soon (hopefully the free time fairy will stop by my house and hang out for a while)! 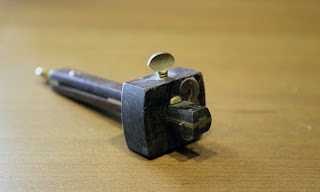 Another project which I will venture this year, will be a marking gauge or scratch gauge. I love this marking gauge. It is old, ugly and beat up, but it works great. 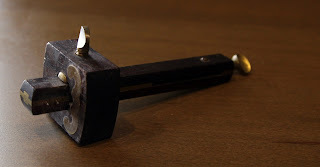 I had to sharpen the pin into a knife's edge as the conical pin shape tended to follow the grain of the wood rather than marking a straight line. Here is an excellent article on marking gauges that I wish I had found when I first got my gauge, Popular Woodworking Marking Gauge Article. 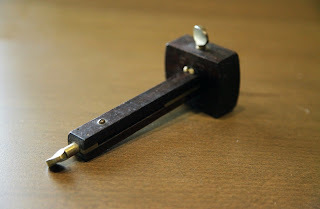 I don't care much for the design of the marking gauge they use in the article, though it is rather ingenious, but the information in the article is golden. The nice thing about a marking gauge is that it makes a straight line at a set distance over and over and over again. More than one marking gauge is a great investment (feel free to tell your significant other I said so) as you can set each one to a different distance, one for depth and one for width, and use them repeatedly on the same project. More on marking and measuring very soon!